AUGUST 2010: This page has been completely revised. The Mining Trails (formerly known as the Mineral Tramways) are multi-user trails but are clearly primarily aimed at cyclists. I prefer to walk so this page is aimed at walkers first, cyclists second. 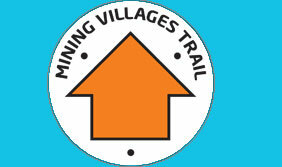 It includes all the official Mining Trails and several additions and variations of my own. The Tolgus Trail never got constucted so I have created my own alternative. I have devised my own Coast-to-Coast Trail with variations designed to get away from the cyclists. And I have devised an Alternative Coast-to-Coast, also from Portreath to Devoran but taking, for the most part, a quite different multi-user route using four different Mining Trails. 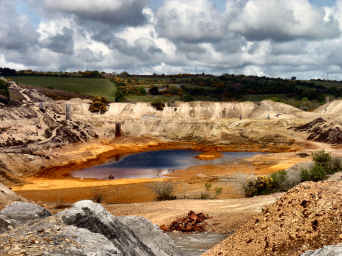 In 2006 UNESCO World Heritage status was granted to large areas of the mining landscape of Cornwall and West Devon. 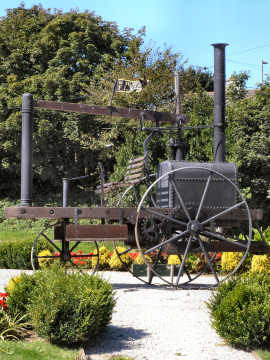 While much of the credit for this achievement must go to organisations like the Trevithick Trust and the National Trust, and to many concerned individuals, Cornwall County Council acted as a major driver. Indeed their Mineral Tramways Project has, in its way, underpinned the whole business by opening up access to many of the inportant sites in the Camborne and Redruth area. We first learned about the existence of mineral tramways when walking around Minions on Bodmin Moor and finding double lines of granite setts. When we learned about the opening of the first Mineral Tramways Trails - the Great Flat Lode and the Coast to Coast - we walked those and loved them. In 2006 work began to open up another 20 miles - Portreath Branchline, Redruth and Chacewater Railway Trail , Tresavean Trail, Tolgus Trail, and a Tehidy Trail through Tehidy Park from Portreath. Opening of all these was originally planned for 2008. As so often with grand publicly funded projects, the timetable slipped and they weren't finished until 2010. The Tolgus Trail was abandoned but I have devised one of my own. More details below and under individual trails. UPDATE AUGUST 2010: Despite a grand launch of the new trails, held at the Elm Farm Cycle Centre at Cambrose on 26 September 2009, the new trails didn't open until 2010. The Redruth and Chacewater is complete, linking the Coast-to-Coast at Twelveheads with the Great Flat Lode and Redruth Church Town. The Portreath Branchline was the last one finished and now links Portreath to the Great Flat Lode at Brea Village, thus completing a new longer, and more interesting, route from Portreath to Devoran. Sadly it looks like the Portreath Incline will not after all be the crowning glory of this trail but, at least, there is an alternative route down to Portreath from Gwel-an-Mor. The 2 mile Tresavean Trail, off the Redruth and Chacewater, was completed some while ago. The Tehidy Trail is also complete but is not really a Mining Trail. My own Tolgus Trail runs from the Coast-to-Coast at Scorrier and links Wheal Peevor and Tolgus Tin with the Coast-to-Coast at Bridge. My Alternative Coast-to-Coast incorporates the Portreath Branchline, the Great Flat Lode, the Redruth and Chacewater, and the final part of the Coast-to-Coast. During winter 2006 I had walked the Copper Trail around Bodmin Moor. In May I walked St. Michael's Way and the Saints Way, both coast to coast trails. In June 2006 I added in another trail, this one from Portreath on the north coast to Devoran on the south. 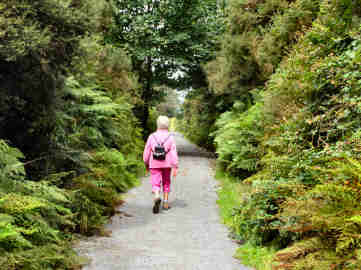 The trail, open to cyclists and horse riders as well as walkers, follows horse-drawn tramways that once served the rich tin and copper mines to the east of Redruth; first the old Portreath Tramroad to Scorrier, then the Redruth and Chacewater Railway to Devoran. It is easy walking, gentle gradients take you up to only 300 feet at Scorrier. The 12 mile cyclists route is completely straightforward. My longer 16¼ mile walkers route includes off-trail paths between Bridge and Scorrier; the Loops, shown on the official map; and some alternative paths between Poldice and Twelveheads. 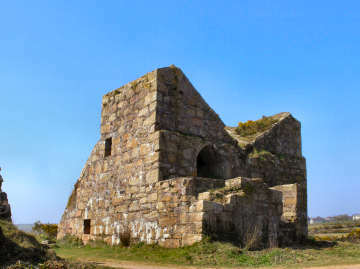 My walkers route also includes a great deal more interest: Wheal Peevor Mine, Hawke's Shaft Engine House, Wheal Busy Mine, Poldice Arsenic Calciner, and Penpol Creek are the major sites. There are informative storyboards along the way, not least at Portreath harbour and Devoran. Waymarking is tasteful and good. There is ample opportunity for refreshment along the way, see box below. You may be able to walk the trail in one go using public transport. First Bus 43 and 44 links Portreath Beach with Redruth Station. First Bus 47 (Not Sunday) links Redruth Station with Devoran village. REFRESHMENTS ALONG THE WAY: 2 pubs, 2 seasonal cafés, Portreath. Bridge Inn, Bridge. Bike Barn at Elm Farm near Cambrose. Smokey Joe’s café Scorrier (just before the A30 crossing). Plume pub (food all day), Fox & Hounds pub (all day F & S only), Scorrier (all a little off the walkers route). Bissoe Cycle Hire café, Point Mills. Old Quay Inn, Devoran. One way and another I have walked round these two 'loops' off the Coast-to-Coast Portreath to Devoran mineral tramway route on many occasions, the first being a walk round the Wheal Busy Loop with Jane back in late spring 2004, when the bluebells in Unity Wood were superb. Since my operation I have had to keep my walking simpler, avoiding severe parts of the Coast Path and avoiding too many stiles. So the Mineral Tramways trails are ideal for me. On this occasion I decided to combine the two Loops but in a different order and direction from previous occasions. I parked in the little known official MT car park by Rodda's Creamery near Scorrier and set off first on the direct Coast-to-Coast as far as Unity Wood. I then did a right on to the Little Beside Loop but extended it to include additional ground at Poldice. I then headed back up the Coast-to-Coast to Unity Wood and there did a right to follow the Wheal Busy Loop back to the start of my walk. My route covered about 6¼ miles; had I stuck to the official Little Beside Loop the total distance would have been about 5½ miles. 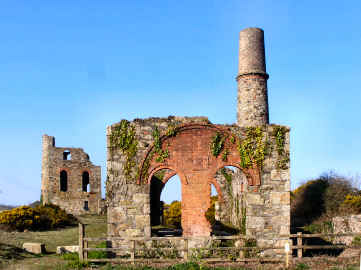 Interest along the way includes attractive Poldice Cottages at Little Beside; the chimney and other mine remains at Poldice; Hawke's Shaft engine house, with Cornwall's tallest chimney, just north of Unity Wood; Wheal Busy Workshops, pictured; and Wheal Busy Chapel. A good walk. 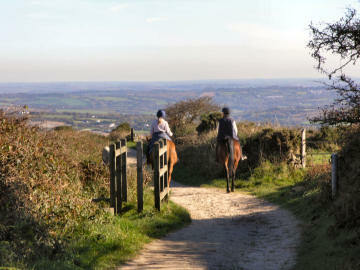 The 7½ mile multi-user trail, a little to the south of Camborne and Redruth, circles Carn Brea hill, around what was once one of the busiest tin and copper mining areas in the world. The trail consists of well-laid tracks on former mineral tramways. Signage is good and there are only two minor climbs along the way. Three detours are suggested. The first is to climb Carn Brea Hill, easily identified by its Castle and eye-catching Bassett Monument; OS 104 will suggest an obvious route near the start of the trail. The short second is to see St. Euny church at Redruth Churchtown. The third is for lunch at the ordinary-seeming but quite excellent Countryman Inn at Piece (good value hot baguettes and super giant Cornish pasties). Because the climbs take you up to around 650 feet, the views are terrific for much of the time. For fans of industrial remains there is a lot of interest along the way (see below) so what could be walked in two hours may well take 4 or 5. There is a large car park at South Wheal Basset, small one at Seleggan Smelter and some parking at Brea village but we prefer to use the little car park at Cowlin's Mill, near Tincroft Mine, just south of the railway at Pool, as this makes the Countryman a most convenient lunch break. There was formerly a Tramways Centre at Cowlin's Mill but now go to King Edward Mine or to Cornish Mines and Engines in Pool for info. Carn Brea: Do not follow the GFL sign in Tregajorran but continue on the lane uphill. At last cottage follow FP sign roughly E up Carn Brea. At top, (5 paths) head ENE by Basset Monument and Carn Brea Castle and on down to the Trail. Carn Brea Village: At 68632/41211 at 1.14 miles ignore WM R on track, continue through Carn Brea Village, turn R past St. Euny Church, pick up trail at 69171/41070. Reduces total walk by 0.78 miles to 6.84 miles. St. Euny Church: Redruth Churchtown, just N of Trail sign up to Wheal Uny. Countryman Inn: At South Wheal Frances, at 68171/39366 at 4.05 miles, bear R, buildings on L, on path downhill to clear ground. Keep N through scrub towards Thomas’s Shaft engine house on Four Lanes to Pool road. In the open follow the LH hedge to road. Go L on road with care. Countryman is at 67896/ 39755 at 4.46 miles. Retrace steps to continue on Trail. Adds 0.83 miles. Arriving at the Countryman Inn from S Wheal Frances, note just to its R, on corner of road to Carnkie, a rising coffen and wooden stile to a field. Leaving, cross this stile into a field and follow LH hedge, initially alongside Countryman, for about 150 yards to a wooden stile, coffen stile and wooden stile to a second field. Cross roughly NNW. As you pass a burrow on your R, views open out over Pool, and over Camborne to St. Ives Bay. Continue to a tall WM post on RH edge of a small clump of trees. Cross a high wooden stile and go down a steep step stile to a track (runs between Bowling Green and Bosleake farms). (You could go L on track and follow it down to and through Bosleake Farm to a probably open gate and then continue forward uphill on a tarmac track. This adds about 100 yards. But …) Go L on the track for about 30 yards to find a WM on the R. Cross a rough coffen stile and along a narrow path through an overgrown area to a cattle stile (WM) to a third field. Cross roughly NW downhill, soon passing a standing stone off to your R then a tree growing from an odd stony mound, to a wooden stile and cattle stile to a tarmac lane. Go R on the lane uphill. At the top pass Highcross Cottage on your L and continue downhill to Tregajorran hamlet. Where lane bends L the GFL comes in on your R. Continue on lane to a T. Go L for about 175 yards to a T at Pool to Four Lanes road and go R into Old Cowlins Mill CP, reaching storyboard at 1.11 miles. If walking the trail counter-clockwise and returning direct from the Countryman to Old Cowlins Mill, total distance is 5.09 miles. I have walked the Great Flat Lode Trail many, many times - but always before in a clockwise direction. In late June 2015 I decided that I was fully recovered from the recent bout of pneumonia and could happily tackle the 7½ mile GFL. This time, however, I decided to walk it counter clockwise for the very first time. As ever, I encountered few other users, just a couple of local dog walkers, a couple of cyclists and a couple of horse riders. It surprised me just how different it seemed walked in this alternative direction. Instead of starting the walk with Carn Brea dominating one's view, it really didn't come into prominence until I reached South Wheal Basset. Proliferation of two things struck me. On the credit side, the wild flowers: pink and white campion, ox-eye daisies, foxgloves, summer snowflakes and even, on the high ground, thrift, normally only a wild flower of the north coast. On the debit side, an awful lot of dog turd, presumably left by local dog owners, who should be ashamed of themselves. Passing King Edward Mine Museum, I noticed that an old arsenic calciner is being excavated, presumably to become a feature and presumbly financed by 2014's million pound Heritage Lottery grant. My one reservation about this reverse walk is that the steep 150 foot climb up from Brea Adit feels much tougher than the more gentle 250 feet from Churchtown to Wheal Buller on the clockwise route. I have walked the Great Flat Lode Trail on many occasions - and have walked parts of it when walking the Land's End Trail or visiting Carn Brea. I like to leave the trail sometimes to take in additional interest, so this item includes some off-trail sites. The sites are listed in clockwise order, starting at Cowlin's Mill. St. Euny Church: Just off-trail at Redruth Churchtown; medieval tower but Georgian nave; fascinating graveyard with massive mining family tombs; impressive lych gate with two coffin rests. 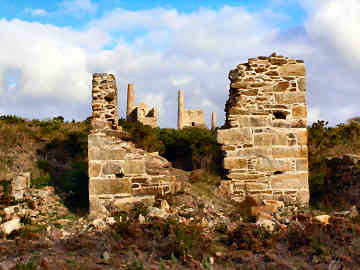 Wheal Uny Mine: Just off-trail, on emerging from woodland at top of hill after Redruth Churchtown; two impressive engine houses, surrounded by heather. Seleggan Smelter: Just off-trail; when you reach the road after Wheal Uny, turn right down the hill; minor remains of Cornwall's last operating tin smelter, closed 1931; small car park. Wheal Basset: Substantial remains of major copper mine; good storyboard, large car park. Wheal Basset Stamps: Off-trail in Carnkie village; leave trail after Wheal Basset at Hillside Farm lane, into Carnkie village, right on road, site on left; major remains of ore-crushing and preparation site. 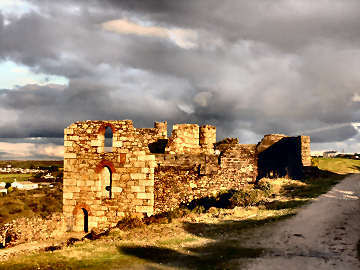 South Wheal Frances: Marriot's Shaft is the finest ruined site on the trail; remains of Boiler House, Compressor House, Ore Crusher, Miner's Dry, Smithy and winding engine house and the bases of ore bins; good storyboard; leave the trail here for the Countryman pub. Further on you pass the engine houses of Pascoe's Shaft and Daubuz's Shaft. King Edward Mine: An important museum at the site where the Camborne School of Mines used to be based; the Mill is complete and the tour includes a fascinating museum and some working machinery; very helpful and informative staff. Brea village: Here the Great Flat Lode Trail links with the Portreath Branchline Trail. As the Great Flat Lode trail leaves the village, good view of South Crofty, only working mine in Cornwall, re-opened in early 21st century, exploratory work progressing. Brea Inn pub closed 2012. Williams Shaft: Off-trail, up steep hill SW from Brea village; worth a visit for the remains of the Morgan's patent traversing engine that operated winding gear. Tincroft Mine: The last site before you get back to Cowlin's Mill; delightful romanesque architecture. 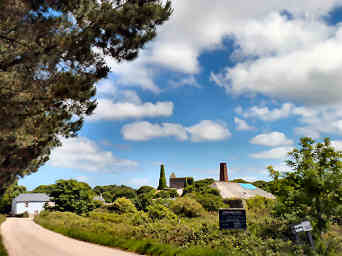 Cornish Mine and Engines: Major National Trust museum in Pool, ½ mile north of Cowlin's Mill; at Taylor's Shaft, film, displays, models, great 52 ton beam engine; at Michell's Shaft, across the road, a working beam engine. UPDATE OCTOBER 2009 At last I have seen cyclists on the Great Flat Lode Trail. In September 2009 Jane and I attended King Edward Mine's Open Day, which we enjoyed. To fill out our day we walked the Trail from King Edward to South Wheal Frances and back, lunching at the Countryman at Piece. To our surprise we saw a group of about 15 cyclists on the trail, clearly enjoying themselves. We also saw a family on hired bikes. The children were finding it hard going - the trail is by no means flat - and we think they probably gave up and turned back. I had walked, as far as was possible, the line of this route in November 2006. Then in August 2007 Jane and I joined a superb guided walk on part of the projected route. Our guides were mining men Eric Rabjohns and Mark Kaczmarek and Trevithick Society industrial archaeologist Kingsley Rickard - all highly knowledgeable, informative and entertaining. Now that the route is complete in 2010, I have walked it a couple more times, first following the official cyclists route, then devising my own, much improved, alternative for walkers. 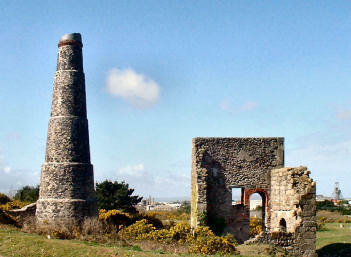 The R & C links with the Great Flat Lode trail at Wheal Buller but really starts at Redruth Churchtown. It should have started in Redruth itself, linking there with the ill-fated Tolgus Trail, but that's another story. 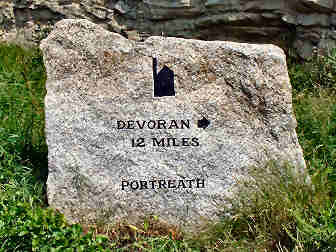 At its southern end it joins the Coast-to-Coast Trail on its way to Devoran. Interest along the way includes St. Euny's church, Wheal Uny mine, Pennance Consols engine house, fascinating Carharrack village and its shute, Wheal Maid Valley, United Downs mine and its massive and colourful tailings dam and a glimpse of the amazing Great County Adit. The disappointment about the official route is that, from Pennance Consols, it follows a low level route to Carharrack, using a fast and dangerous road part of the way. That, and the great views afforded, is why I have devised an alternative high-level walkers route. Follow the official trail from Redruth Churchtown. But do first take a look at St. Euny's Church and, after leaving the woodland near the top of the hill, do take a look at the engine houses of Wheal Uny mine. Continue on the trail to cross the busy A393 and follow Carn Marth Lane to just past Pennance Consols engine house. At 71317/40578 ignore the forward trail waymark and bear left uphill to the summit at 71697/40841, by a pool in a quarry on your left. At the cross track, go right downhill on a bridleway, crossing a minor road, and at 72565/41248, with a cottage on L, go R through kissing gate and bear L on central path through light woodland, through a kissing gate and down to a cattle stile at 72741/41287. Continue down on a track and tarmac lane to a triangular green and Carharrack Shute at 72847/41261. Go R on Shute Hill down to road from Pennance and cross to the official cycle route at 72811/41074. Go L then ignore trail sign pointing R and follow track and road into Carharrack village. Just before main road, cross Wheal Damsel Road on L and and take footpath past Methodist Chapel (1815) and Sunday School, to Chapel Terrace Go R down Chapel Terrace, L on Church Street and fork R on Church Row to 73225/41486 by bus shelter and phone box. Go R on Squire Lane and follow to cross track T at 73448/41177. Go L to rejoin the official route. Wheal Maid Valley Update: In early September 2013 I walked from Lanner reservoir, on the Redruth and Chacewater Trail, to the Wheal Maid Valley and back. The Mining Heritage department of Cornwall Council had recently carried out stabilisation work to the skeletal remains of three engine houses high above the valley and its amazing tailings lagoons. However, what struck me most was the amazing display of purple heather all over the hillside. I noticed a lack of BMX cyclists on and around the tailings dam and the hillsides. Gwennap Council, which owns the site, has been cracking down on motor cyclists. I suspect they may also be discouraging BMXers on 'Elfin Safety' grounds. Hope not. INTEREST ALONG THE FULL WALKERS ROUTE: St. Euny Church: Just off-trail at Redruth Churchtown; medieval tower but Georgian nave; fascinating graveyard with massive mining family tombs; impressive lych gate with two coffin rests. 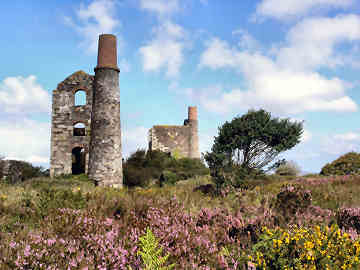 Wheal Uny Mine: Just off-trail, on emerging from woodland after Redruth Churchtown; two impressive engine houses, surrounded by heather. Pennance Consols: Baronet's Shaft engine house. Carn Marth Amphitheatre: Quarry turned into amphitheatre, occasional theatrical performances. Carn Marth Views: SE to Falmouth bay, docks and Pendennis Castle, E to United Downs waste site and Taylor’s Shaft, ENE to Clay Country, NE to Chiverton and Carland Cross wind farms, NNE to St. Agnes Beacon and the sea. Carharrack: Shute (former village water source) at the triangular green; recreated plateway on track towards village and storyboard by Iron Footbridge; handsome Methodist Chapel (1815) and Sunday School and village pump on next corner; Carharrack Stars pub, formerly Cap’n Blood’s Tavern. Wheal Maid Valley: Massive and very colourful tailings dam, used by local bikers as BMX track; accessible mine remains on the hill above right. Twelveheads: Named for the twelve hammer stamps that once crushed ore here; hamlet with attractive chapel; birthplace of famous Methodist preacher, Billy Bray. The Portreath Branchline Trail links Portreath with Illogan, Camborne/Pool and Higher Brea and links with both the Tehidy Trail and the Great Flat Lode Trail. A branch of the important Hayle Railway, the Portreath Branchline opened in 1836, carrying freight and passengers, and continued in use as a freight line until 1936. The most important feature was the steep incline plane at the Portreath harbour end. Sadly, it seems that the viaduct at the foot is not to be restored and used but an alternative route has been created up past Feadon Farm to the trail's junction with the Tehidy Trail. The trail starts from Portreath Harbour (good storyboards). A fairly steep path climbs 250 feet up the Feadon Valley. After that it's all fairly level going. There is quite a lot of road, and not a lot of interest, on the way to Park Bottom. After that it's nearly all off-road. The interest starts after going under the A30: handsome contemporary buildings at Cornwall College; interesting little Tuckingmill Park; a delightful 1843 Wesley Chapel and charming terraces of cottages in Tuckingmill; a route through scrub following the tiny Red River to Higher Brea, itself an attractive village; and disused and contemporary mine features at South Crofty. I offer three small detours (see box below) to improve the route for walkers. Horse riders may not like a couple of busy road crossings. THREE SMALL DETOURS FOR WALKERS: 1. Where the track from Trengove Farm bears R, continue forward on a path to the road from Bridge to South Tehidy. Cross this, then cross the next road (East Lodge to Sparnon Gate) and go R on Woodbine to a path leading to Spar Lane, to rejoin the official trail. 2. After Cornwall College, cross busy Tolvaddon Road on the light-controlled crossing. Ignore the trail sign going left; instead go right, towards A30, for a pedestrian entrance to Tuckingmill Valley Park on your left. This heads down then left to pass mining remains that the official route misses. Leaving the park, unless you want the visitor centre (probably closed) to the left, head slightly right to follow duckboards past a pond, then go left on Tolgarrick Road to rejoin the official trail at Tuckingmill Hotel. 3. If, on reaching Brea village, you are plannng immediately to join the Great Flat Lode Trail, try this one: at the southern end of what I call 'Red River Park' (between Tuckingmill and Brea), before the foot tunnel under the railway, follow South Crofty's security fence on the left to the twin engine houses of Dolcoath (I think) Mine. Go right over the bridge over the railway. Here the Great Flat Lode Trail goes left clockwise, ahead counterclockwise. January 2014: With the countryside soaked and the coast slippery, I have been re-walking the drier Clay Trails and Mining Trails. At the end of January I parked at Portreath and walked to Brea village and back. Between Gwel-an-Mor and Park Bottom, I was pleasantly surprised to find fields of daffodils coming into flower. Heading down Chapel Road from Tuckingmill Hotel, I could hardly believe my eyes at the vast works going on. I discovered that these were to do with the Camborne, Pool, Redruth East-West Link Road. This appears to go straight across the South Crofty site and will presumably cross Red River Valley as a bridge or viaduct. Presumably the Portreath Branchline Trail, still open during works, will pass underneath the new road. In August 2007, after doing a circular walk up and around Carn Marth, Jane and I took a short walk along the 2 mile Tresavean Trail. We hadn't expected much of it so were pleasantly surprised. This was part of a link from the famous early Hayle Railway to Tresavean Mine. Near the small car park on Lanner Hill by the domed reservoir the trail leads roughly south-south-west uphill. Partly in a cutting, but mostly in the open, views towards Carn Marth and over Lanner village open out, as the trail climbs, to include more distant United Downs. At the far end of the trail a section of old rail has been laid on granite setts and a polished granite block carries a brief explanation of the trail. Except as a dog walker, this little trail is scarcely worth walking on its own. However, now that the Redruth and Chacewater Trail is fully open, you can easily fit the Tresavean Trail in as a handy detour from it. The two link close to Lanner Reservoir. There is a small car park on the Redruth and Chacewater, opposite Lanner Reservoir. I have really only included the Tresavean Trail as it is an official Mining Trail. At only about 2 miles, I can't really recommend it though, if you are a dog walker, you may find it convenient; some do. The official Coast-to-Coast Trail is a superb route for cyclists, almost straight as an arrow for its 11½ miles from Portreath to Devoran, utilising first the old Portreath Tramroad and then part of the former Redruth and Chacewater Railway. Most cyclists will tend simply to use the direct route, omitting the Wheal Busy and Little Beside Loops, which I include. The official route omits superb sites such as Wheal Peevor and much of Poldice Mine; I include them. For walkers, the big drawback of the official route is the sheer volume of cycle traffic at holiday times and the unhappy tendency of too many to treat it as a race track. I have therefore devised an alternative Walkers Coast-to-Coast, following the official route overall but detouring, wherever possible, to avoid the cyclists and to include some unmissable sites. A total of some 10¼ miles of my route manages to avoid the direct cycle route. I have also extended the Walkers Route from Devoran on to Point Quay, where the Redruth and Chacewater actually terminated, and on to the head of Penpol Creek. The resulting route is a substantial 16¼ miles but, with easy walking, most will prefer to do it in one day. I also offer a further possible low tide extension to Restronguet Point, following the foreshore from Penpol Creek for a total of 17½ miles. A seasonal ferry crosses Restrouguet Creek to the Pandora Inn. 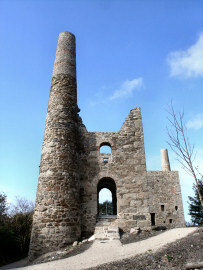 The earliest Mining Trail maps showed the Tolgus Trail going from the centre of Redruth for a couple of miles to link up with the Coast-to-Coast at Cambrose and passing by Tolgus Tin at the Treasure Park tourist site. Ideally, it would have included the replica Murdoch Flyer at the Tesco roundabout in Redruth, the remains of Tolgus Calciner on New Portreath road, and Tolgus Tin at Treasure Park on New Portreath road. I was always dubious about this one and my early attempts to walk its probable route held little promise and I could see no way that it could work as an off-road trail. Gradually, as new maps were published, the plan diminished to just a short link between Tolgus Tin and the Coast-to-Coast at Cambrose. By that time it seemd pointless, except as a means of enticing people to buy jewellery at Treasure Park. Eventally it was abandoned when the money ran out. However, it seemed to me a worthy idea to try to include the fascinating, but poorly manned, Tolgus Tin site on a Mining Trail. So, with the aid of OS104 and a bit of wishful thinking, I went to investigate the possibility of a walkers trail that would include both the superb Wheal Peevor mine and Tolgus tin. It worked. So click below for the route directions for Oliver's Tolgus Trail and for interest. 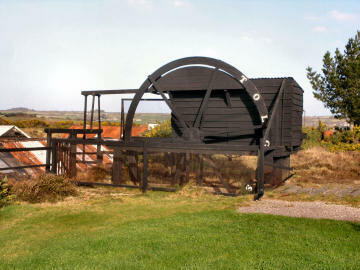 The Waterwheel at Tolgus Tin Route Directions for Oliver's Tolgus Trail. Interest along the way. 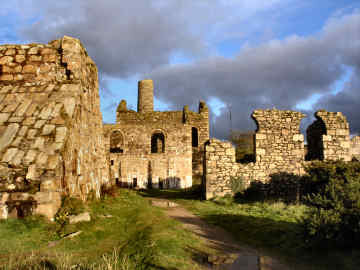 Wheal Peevor: Part of the great North Downs complex, Wheal Peevor is a particularly important site because of the three surviving engine houses. Not only that, it also has remains of an ore crusher, buddles and an arsenic calciner - and more that will remain hidden beneath the furze and bracken. The mine worked intermittently for a hundred years or so until around 1890, producing vast quantities of tin. It re-opened to mine wulfram in 1911 but soon closed again. Good storyboards are located in key positions and viewing platforms are in place. A very impressive site. See full Wheal Peevor entry. The Track: You pass The Track shortly before reaching Tolgus Tin. It describes itself as “home to the finest outdoor biking facility in the United Kingdom … 5-acre floodlit site offering a physical challenge for riders of all ages and abilities.” There is everything there – a BMX race track, a Slopestyle course, a Wall Ride, and a Foam Pit for extreme tricks. Own bike or hire; tuition available. Tolgus Tin: Here is a wealth of original machinery, in situ in a former tin-streaming works. Once owned and run by the now-defunct Trevithick Trust, it is now owned and operated by Treasure Park, sadly undermanned and with no working machinery. That said, the machinery is fascinating anyway. It includes waterwheels, a Cornish stamps, shaking tables, a round table, a trommel and one seriously ancient artefact, a 16th century mortar stone. See full Tolgus Tin entry. Treasure Park: Very much a “tourist attraction”, catering to coach-loads of visitors to Cornwall, vast sales areas feature gold, silver and other jewellery. We were slightly surprised to find that it really isn’t a tourist trap and that quality and value are better than we had expected. Whether it will appeal to trail users is another matter entirely. Bridge: The charming village includes handsome Georgian Laity Farm, converted Laity Mill, attractive Tregony House and the Bridge Inn, a local with good simple food. The original plans for the Mining Trails would have seen the Redruth and Chacewater continue into Redruth, and a Tolgus Trail extend that from Redruth to Cambrose, passing Tolgus Tin. Disappointed that these routes never happened, I felt I should devise a route to replace them. Here it is. *Start at the Great Flat Lode Trail sign at 69171/41070, at the northern end of the Redruth and Chacewater Trail, on the minor road from Churchtown to Carnkie. 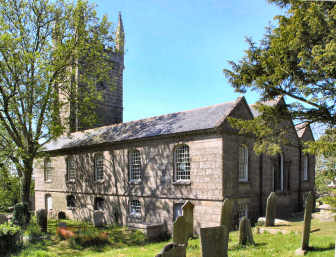 Go north on the road for about 270 yards to St. Euny’s church, Redruth Churchtown, at 69156/41269. (Note former Feathers Inn opposite; might that have been a case of thirsting after righteousness?) *If you have come down the path and track from Hind’s Shaft, Wheal Uny, on the Great Flat Lode and Redruth and Chacewater Trails, you will join this route at Trevingey Road at 69417/41516. Go right on Church Lane, alongside the cemetery, to Trevingey Road at 69264/41424. Go right uphill on this road to Coach Lane. Go left on Coach Lane for few yards to 69227/41569. Go right down Church Lane (a tarmac footpath) to West Street. Go right on West Street for 75 yards to the traffic lights in Redruth centre at 69691/41945 (¾ mile). Go left on Chapel Place to Redruth Health Centre and there go left on an unsigned tarmac footpath, between high security fences, to a lane. Go right downhill on the lane and pass between gate pillars for a few yards to 69397/42257. Go left, over a clapper bridge, and left again on an unsigned tarmac footpath, passing Tesco on your right, to Tolgus Vean at 69209/42385. Cross Tolgus Vean, then immediately cross Tolgus Hill to 69241/42433, with the Murdoch Flyer replica on the roundabout to your right (1¾ miles). Go left down Tolgus Place, passing under the A3047, to Old Portreath Road at 69172/42756. Go left uphill on Old Portreath Road to the former Cornish Arms pub, then right on another minor road to the crossroads at 69060/43771. Go left on New Portreath Road, then left into Treasure Park, leaving it to the right of Tolgus Tin, over grass to rejoin the road. Continue for a short way to a small open area on the left at 68968/44459, opposite the road into Parc Erissey (3¼ miles). Oliver's Tolgus Trail crosses here, L for Bridge and Portreath and R for Wheal Peevor and Scorrier. With the above instructions, I am sure you could figure it out. Here it is anyway. Start at the small open area opposite Parc Erissey turning (The Track) on B3300 Redruth to Portreath road at 68968/44459. Go right on road towards Redruth. After 200 yards, go right over grass into the Treasure Park site by Tolgus Tin and through the car park to the vehicle entrance. 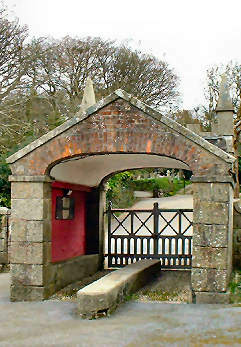 Go right on the road to the cross-roads at 69060/43771, and right on the Illogan road for about 550 yards to the former Cornish Arms at Sparnon Gate. Go left on Old Portreath Road, finally under the A30, to New Portreath Road at 69150/42851. Go right up Tolgus Place, under A3047, to the Murdoch Flyer roundabout, opposite Tesco, at 69241/42433. Cross Tolgus Hill, and cross Tolgus Vean to 69209/42385 (1¾ miles) to take a tarmac footpath alongside Tesco. Just before the end of the path, at 69397/42257, cross a clapper bridge and go right between gate pillars on a lane uphill for about 75 yards. Go left on a tarmac path between security fences, with the former Redruth Brewery on your left, to Chapel Place. Go right on Chapel Place to the traffic lights at Redruth centre at 69691/41945 (2½ miles). Go right on West Street for 75 yards then left uphill fairly steeply on a footpath, Church Lane, under the railway, to Coach Lane at 69227/41569. Go left on Coach Lane, then right on *Trevingey Road downhill to 69264/41424. Go left on a wide tarmac lane, Church Lane again, alongside a cemetery on the left, to St. Euny's Church, Redruth Church Town, at 69156/41269 (3 miles). (Note the former Feathers Inn opposite; was this a case of thirsting after righteousness?) Go left on a minor road for about 270 yards to 69171/41070, to join the Great Flat Lode and Redruth and Chacewater Trails at the Great Flat Lode sign (3¼ miles). 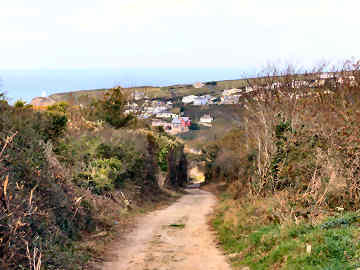 *If heading directly for the Great Flat Lode Trail or the Redruth and Chacewater Trail, on Trevingey Road, opposite Blights Fish and Chips, you could go left on a footpath which bends right and left to continue as a track fairly steeply uphill to Hind’s Shaft engine houses, Wheal Uny Mine, and on to join the trails at 69347/40702.